This post is sponsored by Tanimura & Antle. As always, all opinions are 100% my own. You should officially be over all the excess eating that happened during the holidays and well on your way to consuming healthier meals. Even if you aren't planning a major overhaul of your diet, taking a wholesome approach to food and lifestyle in the New Year can be made easier with premium fresh produce from Tanimura & Antle. (You can find Tanimura & Antle lettuce at Marcs.) For example, their Artisan Lettuces and Artisan Romaine are field picked, by hand, for freshness and offer a variety of flavors so you no longer have a boring salad bowl. If your goal is to increase your salad intake in the New Year, keep in mind that each package of Tanimura & Antle Artisan Lettuce contains four heads from the six varieties that they grow. Green or red, ruffled or scalloped, each variety has a distinct, complementary flavor. Although this might sound daunting, the good news is, you can mix and match them however you like to create a healthy and delicious meal. Basically saying good-bye to boring salads and hello to vibrant and tasty greens. 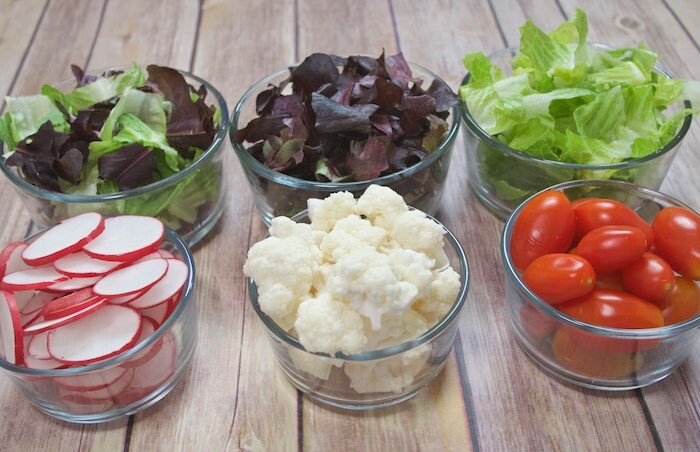 Keep in mind that to create a well-balanced meal it's important to include protein and/or additional vegetables in your salads. Prepping meal components in advance is a huge help in keeping your nutrition goals in line. A good practice is to chop, clean, and package your produce and protein immediately upon returning from the grocery store. How you decide to dress your greens is also of great significance when it comes to eating healthy. Instead of opting for calorie laden dressings, try a homemade version whenever possible. It's not as hard as you think to make salad dressing from scratch, and the finished product always tastes much better than the store bought version. 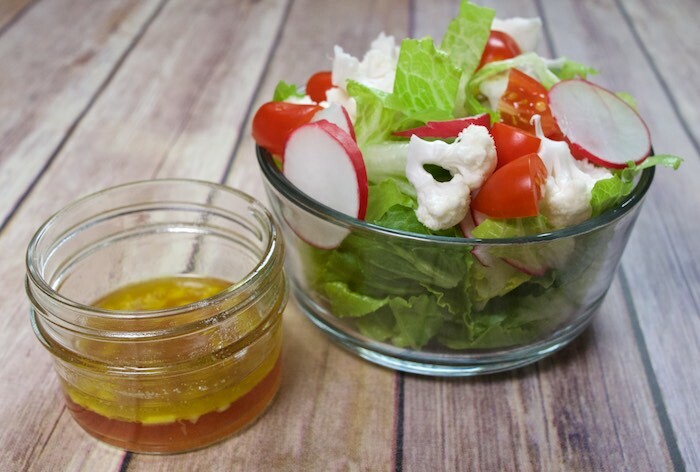 Below are two of my favorite dressing recipes: a garlic vinaigrette and a creamy balsamic Dijon. Both varieties can be made in advance and kept in the refrigerator for up to a week. Use them on your favorite Artisan Lettuce today! In a small bowl whisk together olive oil, vinegar, garlic, garlic powder, and salt. Use immediately or store covered in the refrigerator. Add all ingredients together in a bowl and whisk until combined and smooth. Add salt and pepper to taste. It’s a New Year which means you have a Fresh Start to get healthy with Tanimura & Antle Artisan Lettuce and Artisan Romaine! Visit ArtisanLettuce.com and enter your information for chance to win a Fresh Start prize pack. As a bonus for entering you will be able to download a healthy eating tip sheet. Your balsamic dressing sounds great, I can't wait to try that one! This dressing sounds great. Definitely pinning this one for later! Mmm the garlic vinagrette looks simple and yummy. I love garlic! Prep is always KEY to staying on track with healthy eating. Love these salads and the dressings look so tasty! I love eating this way everyday! All fresh foods and no processed foods is an attainable goal! Now this is a healthy version of healthy!! Love it! Homemade is always the way to go, especially when dijon is involved. Yum! Must remember to make this ahead of time so I have it on hand. Homemade dressings are always so much better! I love homemade dressings! These sounds wonderful to me. I HAVE used this brand, and like it quite a lot. Eating more salads is on a lot of people's radar. This makes things easy and delicious. NEED that salad in my life today. I bet the dressing is perfect! I just add olive oil, vinegar and salt directly to my salad the way Italians do in Italy. Love, love, love it! Salads should not be boring! These dressings sound delicious! I think we are all looking for ways to eat a little better this time of year. Tis the season to eat salads! Prep is king! Those dressings sound delicious. I could, and usually do, eat a salad every day, either for lunch or dinner. My husband doesn't like the "weeds" as he calls the fancy lettuce, but he loves green and romaine, so this combo would please both of us! I'm always looking for more great salad dressing recipes, these sound awesome! Love your creamy balsamic Dijon dressing, it sounds delicious! Thanks for sharing, how long do you think they wold last in the fridge, a few days? I love the ingredients you used to make the Creamy Balsamic Dijon Dressing. I love balsamic vinegar. The acid always provide a great balance to almost anything I'm making. Thanks for sharing.